Persian Gabbeh Rugs – Persian rugs made with extra high pile and very simple, graphic designs focused on the use of color, which can be vibrant or soft and earthy. As pieces made for domestic use rather than commercial value in the marketplace, Gabbeh rugs have a cultural authenticity that renders them highly desirable to collectors. Nevertheless, with their lustrous soft wool and emphasis on color over design detail, they are extremely usable today as decorative rugs, especially in informal modern settings. 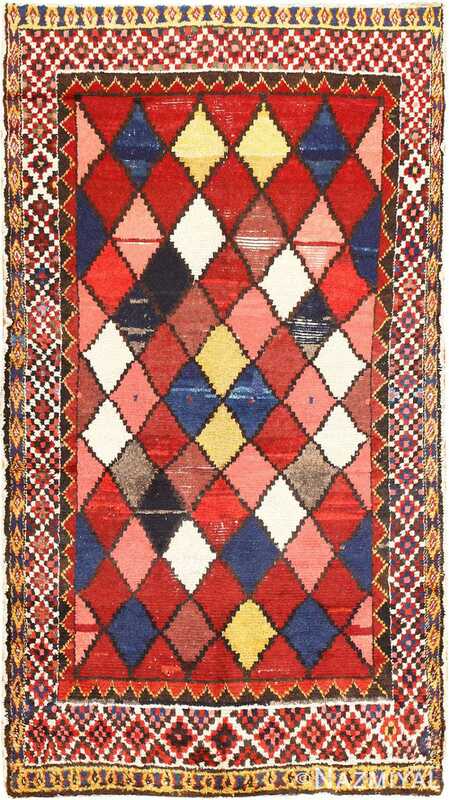 A Gabbeh is a type of traditional tribal carpet originally made by the Qashqai tribe in the Zagros Mountains of Iran. 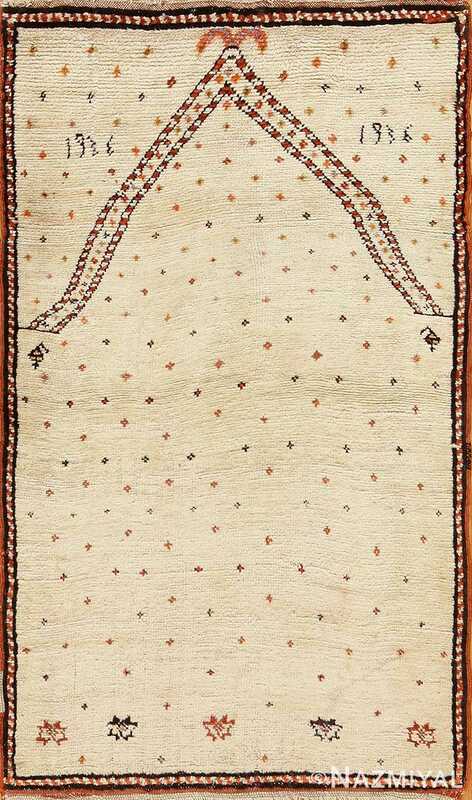 The word can be translated as uncut or unfinished, and refers to the fact that Gabbeh rugs have a rough, primitive look. Gabbeh designs are characterized by broad fields of color with playful geometric forms and animal or human figures. The Qashqai have always been renowned weavers, and even today the weaving of Gabbeh rugs and other wool items form a significant part of their culture and economy. They are an ancient people who arrived in Iran in a wave of nomadic migration roughly coinciding with the invasion of Genghis Khan in the 13th century. Traditionally, weaving of these rugs is done by the women on portable looms that are easily assembled, in keeping with a nomadic lifestyle. 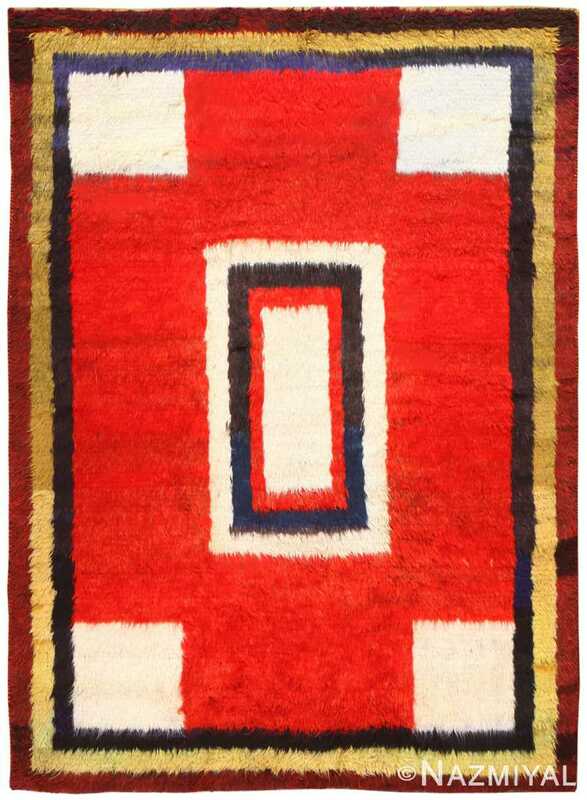 A well-made vintage rug from Gabbeh has a deep pile, often an inch thick, and a relatively low knot density. Since Gabbehs have traditionally been made for informal home use, their designs usually are not stylized and the full creativity of the maker can be expressed. Designs sometimes tell a story, depict a certain place or show an everyday situation. Colors are not subtle; there is no attempt to be subdued! Those who are shopping for Gabbehs should beware of mass-produced knock-offs from India, called “Indo-Gabbehs.” These are often made from inferior wool and do not have the softness and comfort of traditional Gabbehs. Beware of Gabbehs with white fringe, as this is a sign of non-traditional origin. Gabbehs were not originally produced for the retail market. When Jason Nazmiyal exhibited his collection some twenty years ago, it was the first time that Gabbehs would be presented in the United States. 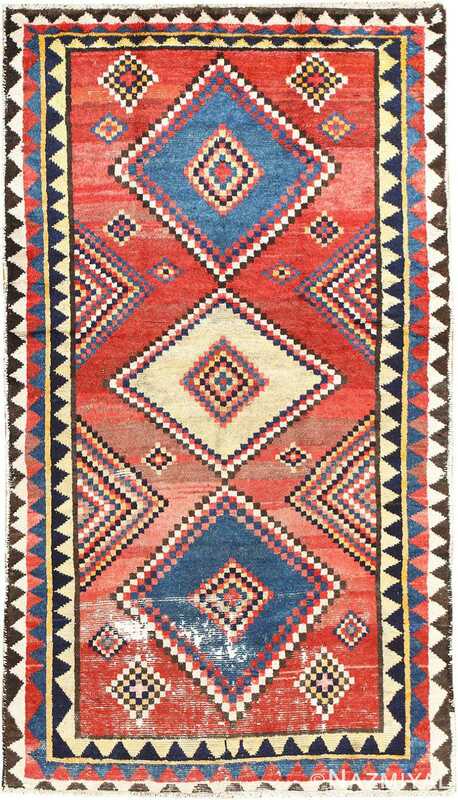 Different from other antique carpets old Persian Gabbeh rugs were not influenced by commercial demand. These works of art were not created to order, but to fulfill the weaver’s own artistic endeavors, and for their own personal use. Persian Gabbeh rugs are a handmade specialty of Iran. 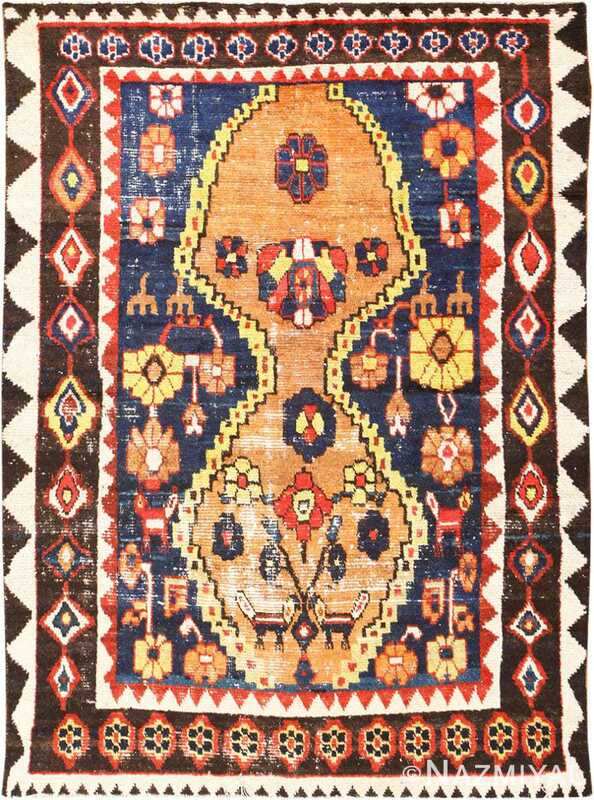 This tribal rug weaving tradition has been passed down through generations of Qashqai rug weavers who skillfully create long and short pile rugs that are used for sleeping and other purposes. Older versions of these Persian rugs were made in brown, beige and ivory from natural, undyed wool. The rug designs and patterns can range from modern geometrical to artistic landscapes to people, objects and animals. The word “Gabbeh” means “unclipped” or “unfinished” when translated into English. New Persian rugs of the Gabbeh style are extremely colorful and imaginative, allowing the creativity of the weavers to shine through. They are not boring, understated or subtle in any way. Some examples include a simple stand of trees, a herd of camels in the desert and objects, such as wine glasses, thoughtfully arranged around geometric human figures. Small animal design figures are also a popular design choice. Other Persian Gabbeh rugs feature brilliant sunsets, deep blue oceans and even the Tree of Life design. 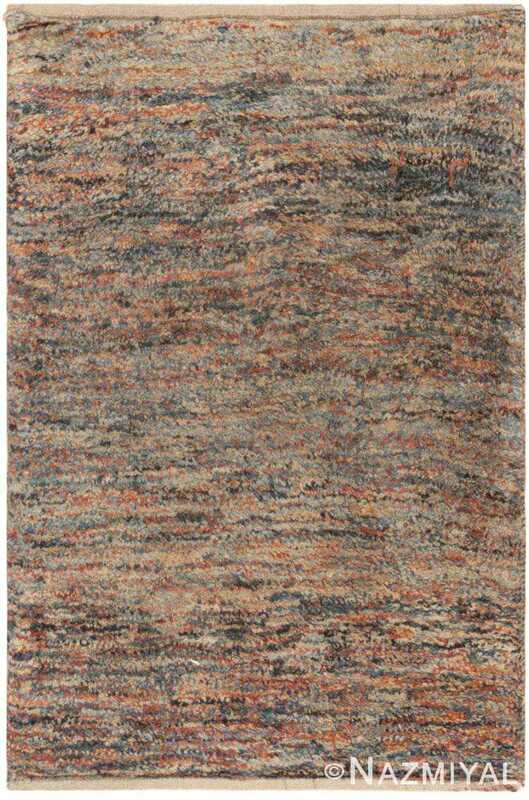 Some of the finest Gabbeh rugs are only fine wool and a single color. 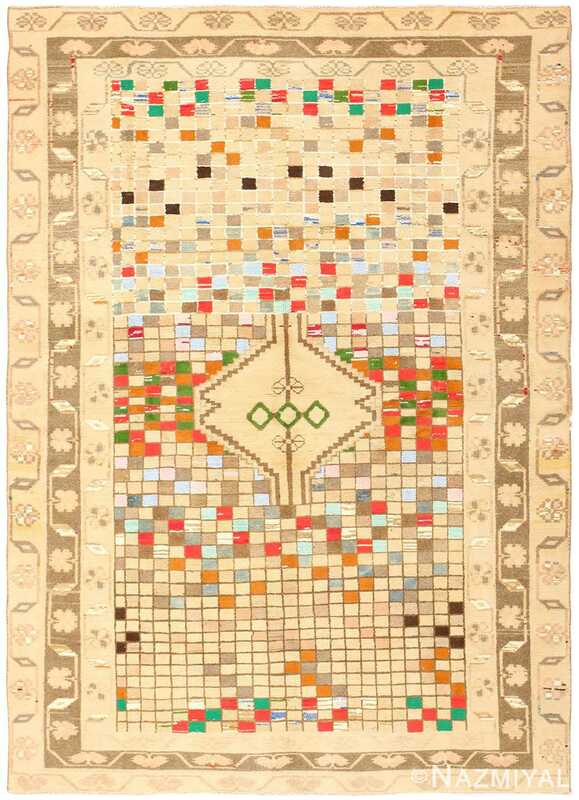 Each of this unique tribal rugs has its own personal qualities that reflect the skills of the weaver. For many, the Persian rug colors are one of the main factor that dictates a rug’s beauty and appeal. 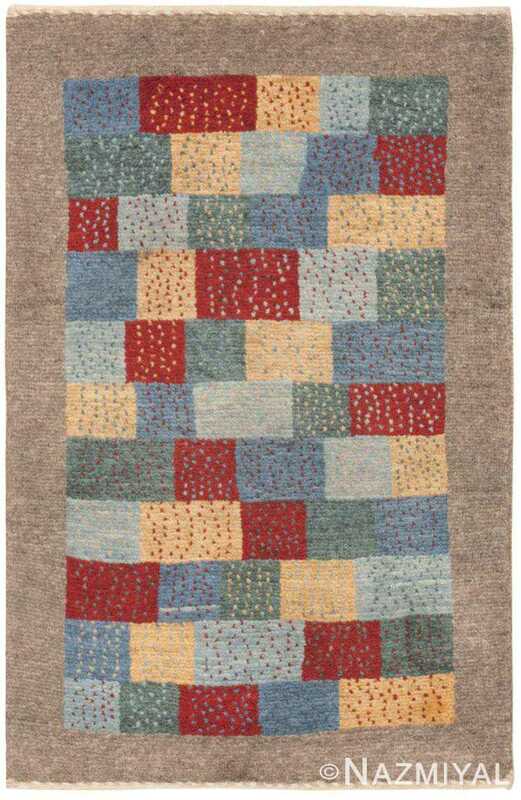 Old fashioned carpet dyeing methods and jewel tones are a common feature in modern Gabbehs. These magnificent shades and hues are part of what makes these rugs so special. These casual village rugs are not suited to stiff and formal home decor approaches. They are best used in more modern interiors and homes with large spaces that can showcase their bolder colors and tribal designs. In addition, they can be color paired with more traditional rugs and used as a highlight in eclectic room decor. As long as the colors work together and are pleasing to the eye, there is no set of rules in how Gabbeh rugs can be used. Many people use the terms “Persian rug” and “Oriental rug” interchangeably, and this is not correct. A Persian rug, such as a Gabbeh, is created in Iran or considered to be a relic of the former Persian Empire if it is very old. 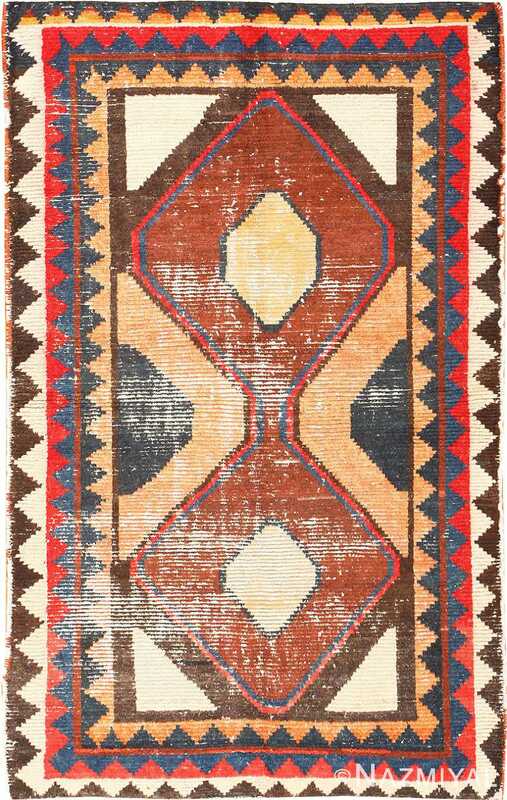 The rugs are crafted by tribes scattered across numerous villages, many of which contain descendants of Turkish people. The most beautiful and unique Gabbeh rugs are made in southern Iran, in the areas surrounding the Zagros Mountains. Using Persian wool that has been hand spun, the rugs are woven in personal homes and represent the rich imagination of individual families. 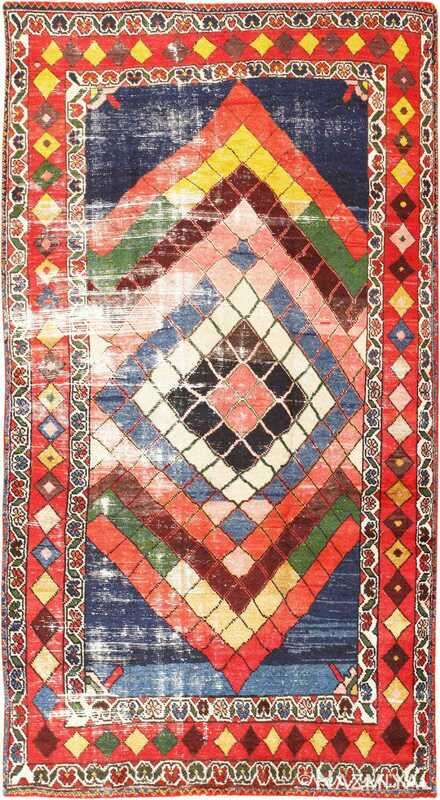 Another type of Gabbeh, the Indo-Gabbeh, is a rug that is copied in the Persian style in India. Unlike their namesakes, these Indian rugs are stiff to the touch and do not have the brilliant color variations that vegetable carpet dyes and hand pun wool produce. Real Persian rugs come directly from Iran, and no other area. In times past, Gabbeh rugs were not as revered as they are today. Merchants and rug dealers considered these rugs and carpets to be unrefined, lacking in class and just simply “crude”, despite their obvious beauty. But today, those are the exact attributes that make them so desirable and unique.